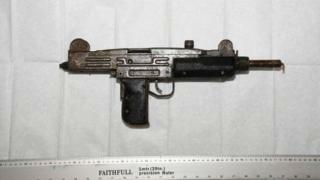 Two machine guns and a self-loading pistol have been seized by police on Merseyside. The weapons were recovered from land at the junction of Seth Powell Way and Altmoor Road in Huyton at about 15:00 GMT on Thursday. Merseyside Police said the firearms had been taken for forensic examination while a search is carried out. Det Ch Supt Mark Kameen said the guns had the "potential to cause serious fear and harm within our communities". He added that they would investigate whether the weapons were linked to any incidents on Merseyside or elsewhere.